Our first birthday show is rapidly approaching! Come along to Sandy's Bar (ground floor of the student union, accessible from the main bar) on Wednesday 4th March for a fabulous lineup of academicomedians. 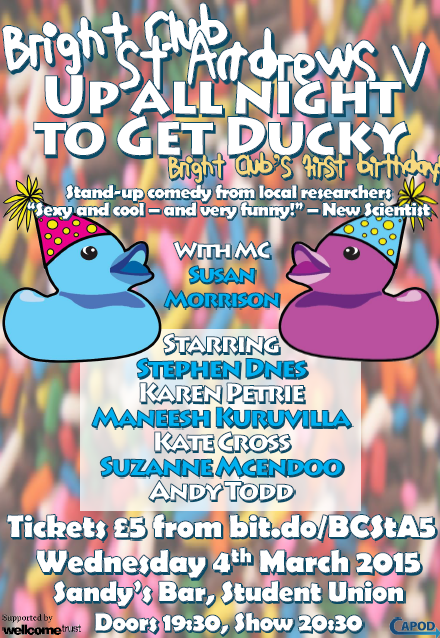 We have the rather excellent Susan Morrison returning to MC for the evening, back for the first time since she hosted our very first show back in February 2014. Andy Todd - Tax It or Eat It? Come along at 19:30 for a 20:30 start. Tickets are available from http://bit.do/BCStA5 for the bargain price of £5 (+ the unfortunate 50p booking fee of doom).